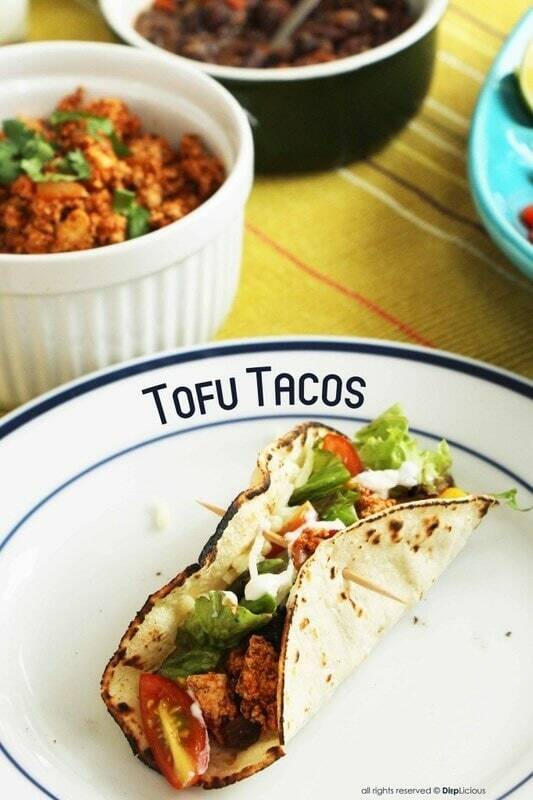 We’d be kidding if we said we weren’t totally obsessed with tacos. What’s not to love, really? Crunchy shells with spicy and tasty fillings, sauces and cheese…our mouths are watering. 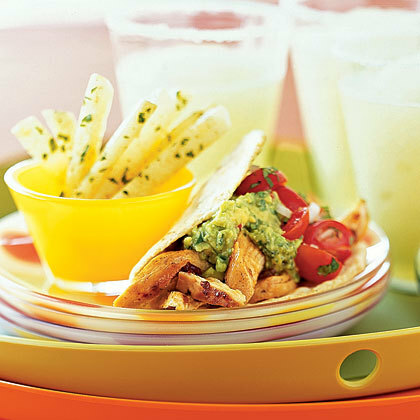 Paired with a dip or just guacamole, tacos are delicious, easy, and so versatile! 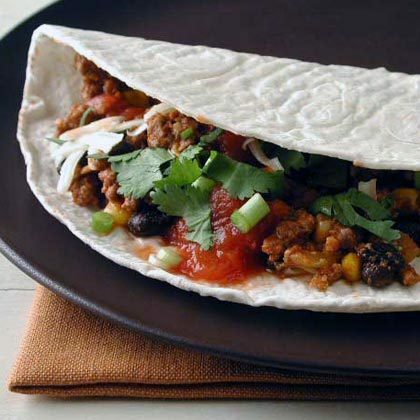 Mexican food is our favourite when it comes to international cuisine, and it can be yours, too! Marinate the chicken with vinegar, bay leaf, oregano, onion, salt, pepper, and chiles. Sauté and cook the chicken and add beer to it from time to time to make sure it doesn’t get too dry. 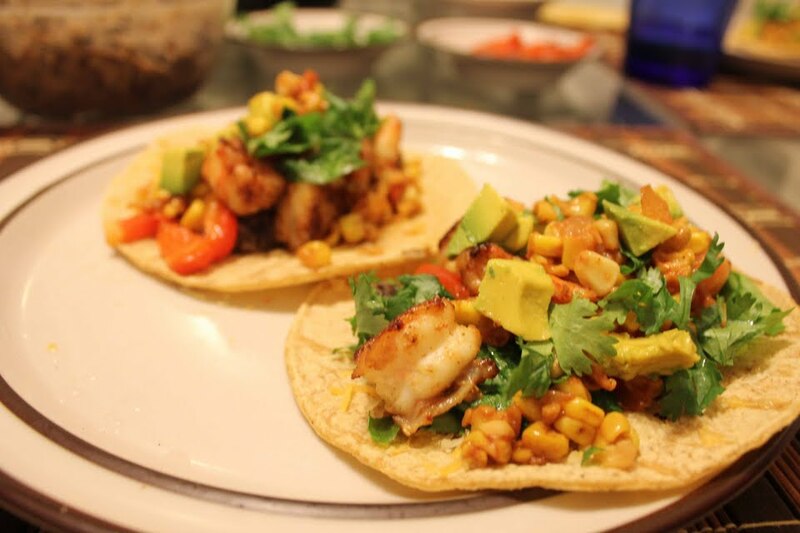 Pull the chicken off the bone in strips, lay them in soft corn tortillas and top it off with freshly chopped cilantro, avocado, and salsa. In a saucepan, add tofu and cayenne pepper to hot oil and cook the tofu until it is golden brown. Add corn kernels, cooked red beans, tamari and vinegar, and cook them for about five minutes. Pile this mixture on a couple of lettuce leaves, lay on diced tomatoes and avocados, and enjoy your vegan meal! For you meat lovers, this one is sure to be a hit. Cook onions, garlic and ground beef in a skillet until browned. Stir in corn, some water, black pepper, black beans, tomato sauce, and chiles, and bring to a boil. Spoon the beef mixture into tortillas and eat up! Press the liquid out of the tofu and crumble it. Sauté onions and garlic until translucent and light brown, then add the crumbled tofu. Mix in taco seasoning, lime juice, and tomato paste and combine. 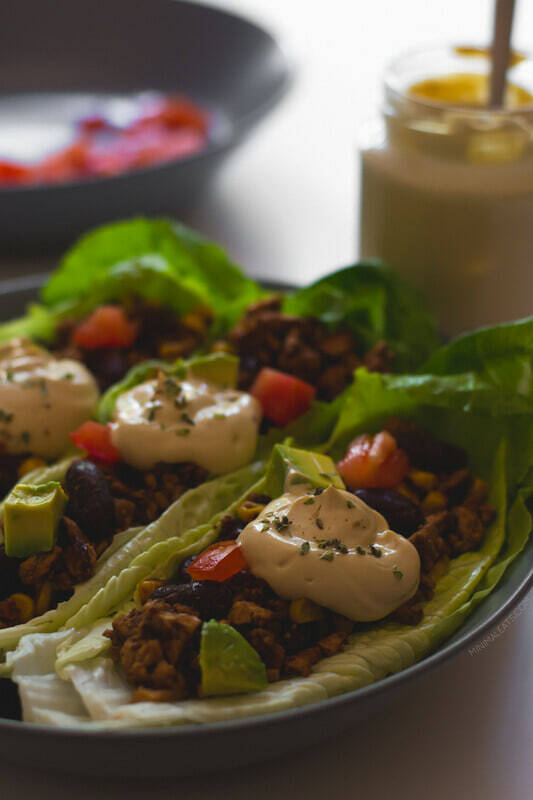 Serve the tofu in tortillas and top them off with cherry tomatoes, lettuce, olives, lime wedges, corn, sour cream, guacamole…basically anything goes with tofu! The only fat in this recipe is the fat that’s good for you, so don’t let it bother you. Marinate steak in oregano, oil, salt, garlic, and cayenne and black pepper. Sauté onion, bell peppers and jalapeno, and then grill the steak. Cut it into thin slices so the steak can be placed in the taco shells. Make a simple guacamole by mixing and mashing avocado, garlic, lime juice, and salt. 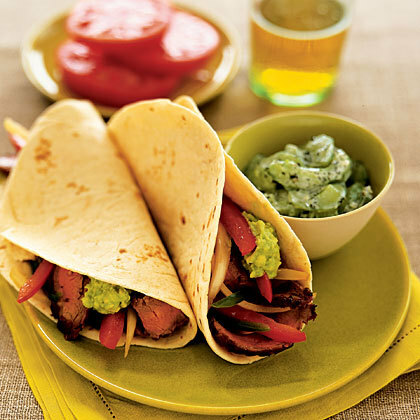 Lay the steak in the tortillas and cover them with the guacamole. If you don’t eat meat, this vegetarian meal is going to be your favourite dish ever. Roast zucchini, red onion, sweet corn, cherry tomatoes, and red peppers. 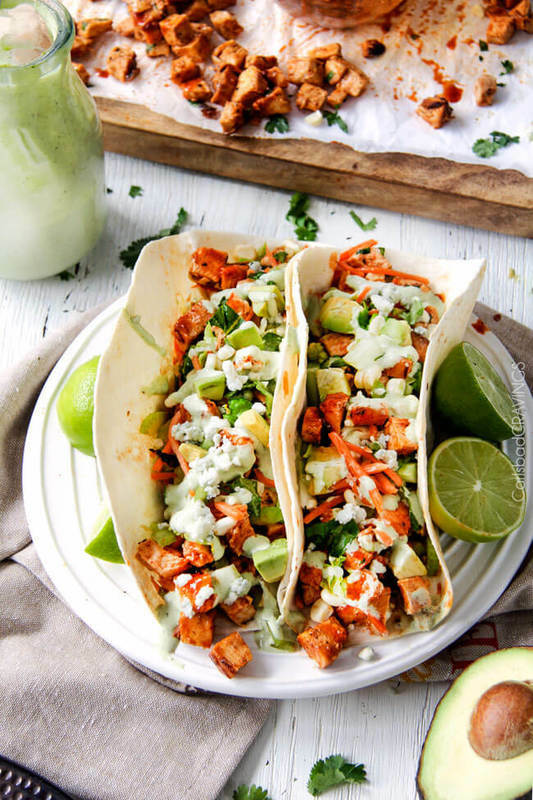 Whip together avocado, Greek yogurt, cilantro, and lime juice while the vegetables roast. Warm up the tortillas, add the roasted veggies, pour the avocado cream over it and add a bit of goat’s cheese, if you like. Prepare buffalo chicken by marinating the chicken in hot sauce, honey, lime juice, garlic powder, salt, cumin, smoked paprika, onion powder, pepper and chili powder. Glaze it with honey and lime juice and then cook it. While it cooks, make blue cheese cilantro ranch by blending mayonnaise, sour cream, cilantro, garlic, salt, pepper, dry parsley, chives, and dry dill. Heat the tortillas, layer the buffalo chicken and top it with the ranch. Roast sweet potatoes, carrots, kale, and red onion. Sauté a whole Portobello mushroom with the top facing down and cook before you turn and cook the other side. Let it cool and then slice it. 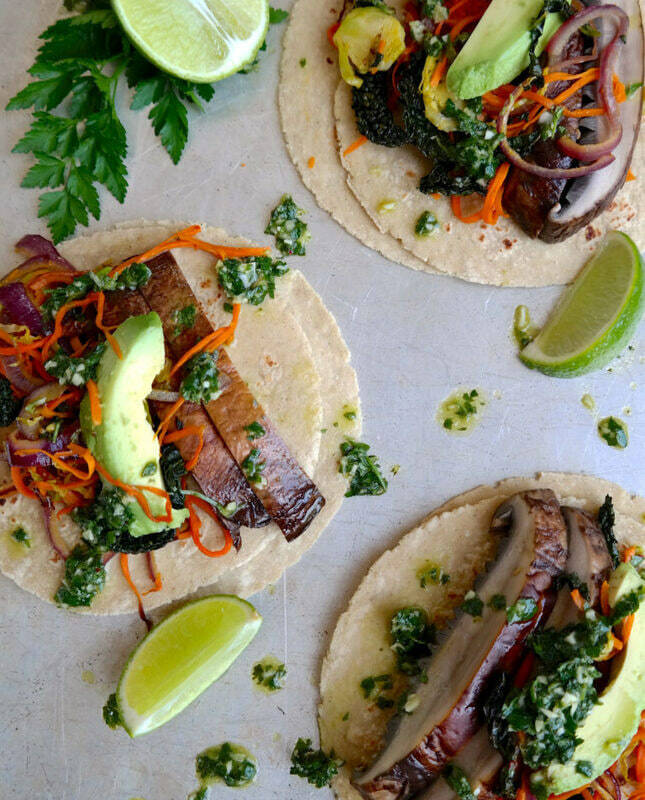 Blend parsley, cilantro, garlic, virgin olive oil, red wine vinegar and lime to make the chimichurri sauce. Warm tortillas and lay the mushroom slices on it. 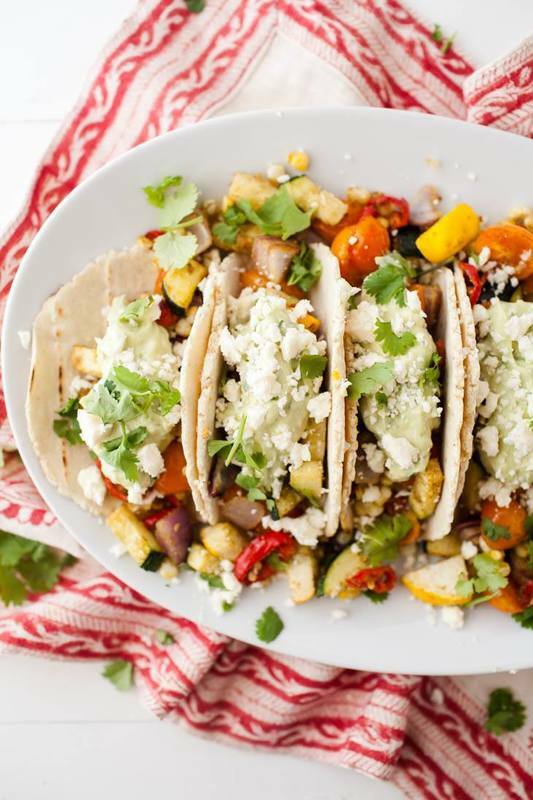 Spoon the roasted vegetables on top and pour the sauce to get yourself a delicious yet healthy taco! We love ourselves some breakfast food, so it was only obvious that we’d include a breakfast taco in this list! In a skillet, heat oil and add onions and a dash of salt, and cook until the onions are translucent. Add garlic, some chilli flakes, and cook. Then add zucchini, yellow squash and bell pepper, and cook till the squash is softened. Remove the skillet from heat, squeeze some lime, and season with salt. In a separate bowl, scramble eggs with a bit of hot sauce, black pepper and salt. Scramble on medium heat until the eggs are lightly set. 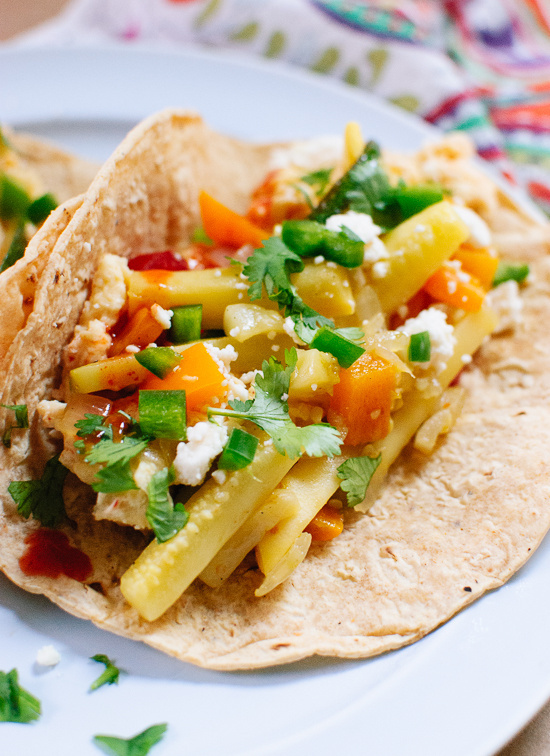 Warm the tortillas, top it with the eggs, pile on the vegetables, and garnish with some cheese and salsa. We’ve got more breakfast food in store for you!